Bass Lake beauty! This large home offers 4 bedrooms, 2 baths and a lovely lake view to enjoy upstairs and an additional 1 bedroom, 1 bath living space downstairs with a separate entrance! The main living area offers a large living room with rock fireplace, formal dining area, 2 breakfast bars and kitchen with access to the huge deck to enjoy the lake and Pine tree views and outdoor entertaining. The master bedroom also has access to the deck and a huge walk-in closet. The deck is partially covered with an above ground spa for relax under the stars! The downstairs apartment offers a living room with large rock fireplace and full kitchen. Wood laminate flooring throughout both living spaces. The unique design of this home offers lots of parking space for 10+ cars, a pull through driveway and covered storage for all of your lake toys! 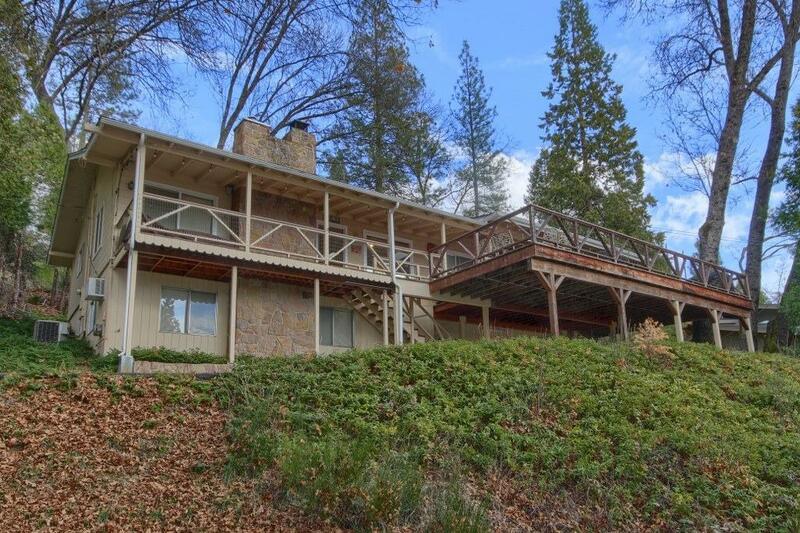 Come and see this Bass Lake beauty and fall in love with everything it has to offer! Plus the Boat Slip rental will be paid for 2 years!